If you have a 10 to 15-year-old in your life who loves films and dreams of being on the red carpet, KIDS FIRST! has the perfect opportunity. Your tween can participate in the KIDS FIRST! Film Critics Boot Camp this summer in New York City/Brooklyn at Zing Revolution and Silver Spring, MD at Discover Communications for an experience they will never forget. Leading the KIDS FIRST! teaching team is Ranny Levy, founder and president of KIDS FIRST! / Coalition for Quality Children’s Media, a former television producer, educator and long-time children’s media advocate. Documentary filmmaker, Nancy Kenney brings years of teaching experience to the team and a practical knowledge of how to inspire students. A graduate of the Berklee College of Music, Nancy co-founded the Children’s Peace Initiative and produces documentary films. Terry Solowey, former assistant director of outreach for Sesame Street Preschool Education Program and manager of outreach for Thirteen/WNET brings additional years of experience in media education. Rounding out the team is Janet Davidson, and EQUITY/SAG actor and DGA director with more than 200 episodic and 20 telefilms credited to her including Earth 2, Cagney & Lacey, Soul Food, Judging Amy and Any Day Now. The KIDS FIRST! Film Critic’s program, now in its fourth year, has received acclaim from publishers and educators alike. The reviews, both written and videotaped, by the team of youth reporters reach an audience of more than 7 million monthly through affiliations with broadcast, print and online publishers including Huffington Post, Kidsville News, Working Woman, Kidzworld.com, HDnet Movies KidScene, LA Parent, Westchester Parent and many more. For more information and to register, go to http://www.kidsfirst.org. Please act soon, because space is limited. Tuition: $459. There is a limited number of partial scholarships available. About: KIDS FIRST! 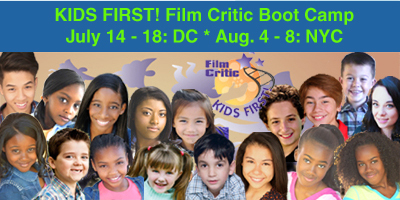 Film Critic Boot Camp is a program of the 23-year-old, national, nonprofit organization, Coalition for Quality Children’s Media whose mission is to teach children critical viewing skills and to increase the visibility and availability of quality children’s media. For more information visit www.kidsfirst.org. This entry was posted on Monday, April 14th, 2014 at 4:29 pm and is filed under News. You can follow any responses to this entry through the RSS 2.0 feed. Both comments and pings are currently closed.